The parking facilities at the port are not always adequate to accommodate the increasing number of passengers who arrive in their cars to catch their boat from the port. With the growing development of the port the importance of a service offering viable, alternative Messina Port Parking has become paramount. For cruise and ferry customers, or for anyone who has a boat moored in Marina del Nettuno, a parking and transfer service which is bookable online would be extremely useful. If you are looking for Messina port parking, you can check prices and availability online in a few simple steps on our website. Our site lists car parks which are hand picked for their affordability, reliability and security. If you need to leave your car near the port before catching your boat, we have the solution which will guarantee you a parking space at an affordable price. By booking online, you can be assured that your vehicle will be in a convenient and secure car park at Messina port, even in high season. Booking is quick and easy. On our website you can check out the car park's features and the services it has to offer with a single click, and another click you can be guaranteed a parking space. Messina Port is one of the main locations linking to the mainland, as well as being the most important Italian stop offs in terms of passenger numbers. The port is located on the western shore of the Straights of Messina opening into a sickle shaped inlet on which stands the town. Every year sees an significant increase in the number of travelers choosing to cruise from Messina turning it into an important location for the main cruise companies. 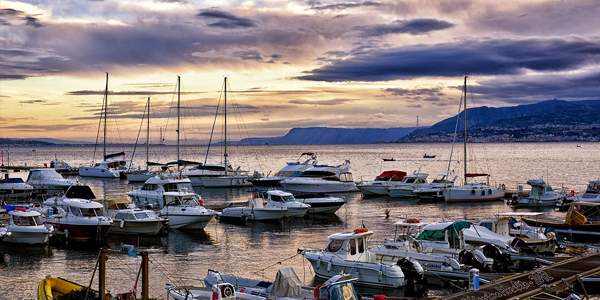 From this port it is possible to sail to Villa San Giovanni, Reggio Calabria, Salerno and the Eolie Islands. The hydrofoil connections to Reggio Calabria are operated by Metromare dello Stretto and Ustica lines in 30 minutes, while to Villa San Giovanni by Metromare dello Stretto in 20 minutes.